Antoine Chevre is Senior Transport Specialist in the Mobility Division of the Agence Française de Développement (AFD). Prior to joining AFD, he worked for 12 years as transport planner in French international consultancy firm. He has worked in the area of sustainable urban mobility in Europe, Africa, Asia and Middle East through devising tailored transportation solutions including urban mobility plans as well as bus rapid transit, light rail, metro, and non-motorized transport projects. Since he joined AFD in 2016, he leads transport and digital strategy implementation. Especially, he organized in November 2017 the event “Towards an Open & Collaborative Digital Data Platform to improve African Urban Public Transport” jointly with Digital Matatus Team from Nairobi or Accra Mobility. He holds a postgraduate degree in urban planning and transport from Sciences Po, France (2002) and a master degree in Urban Utilities engineering from City of Paris engineering school (EIVP), France (2001). Sarah Williams is currently an Associate Professor of Technology and Urban Planning at MIT’s School of Architecture and Planning where she also directs the Civic Data Design Lab at. She is also Co-Founder of Envelope – a real estate software which uses data to develop building zoning envelopes. The Civic Data Design Lab works with data, maps, and mobile technologies to develop interactive design and communication strategies that expose urban policy issues to broader audiences. Trained as a Geographer, Landscape Architect, and Urban Planner. Williams’s work combines geographic data analysis and design. Before coming to MIT, Williams was Co-Director of the Spatial Information Design Lab at Columbia University’s Graduate School of Architecture Planning and Preservation (GSAPP). Her design work has been widely exhibited including work in the Guggenheim, the Museum of Modern Art (MoMA), and the Cooper Hewitt Museum in New York City. Williams has won numerous awards including being named top 25 planners in the technology and 2012 Game Changer by Metropolis Magazine. Her work is currently on view in the Museum of Modern Art (MoMA) and the Smithsonian Museum. Motorist engineer, Gabriel started by working at PSA Peugeot Citroen as a motorist architect during 5 years. Now he’s a connector in the ecosystem of mobility, between corporate firms, startups, labs and cities. 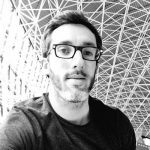 Expert for European Commission, for ADEME (French Agency for Environment & Energy), advisor for several corporate firms, mentor for TheCamp, Gabriel leads http://FabMob.io the 1st public accelerator for creating a new common culture. Writer, speaker and teacher, he aims to inspire major transitions in the field of mobility. Enock Seth Nyamador is a Libre/Free & Open Source evangelist and OpenStreetMap contributor with over 4 years of experience. He has led and supported training events for volunteers, community members and professionals from Ghana ministries, local CSOs and international agencies. 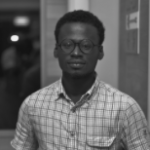 He has also worked on using OpenStreetMap and open source tools for Accra Mobility data collection and mapping. 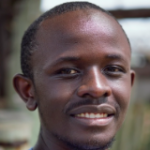 Enock has Computer Science background with interest in geography, transport, urban planning, maps, open data and GIS, which he believes brings about personal and global economy development. He is currently working on Open Cities Africa (Accra); a Global Facility for Disaster Risk Reduction (GFDRR) project in selected African cities as a Senior Mapping Supervisor. 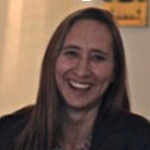 Holly Krambeck, Senior Transportation Economist at the World Bank, leads a diverse investment portfolio of urban and rural transport projects, as well as a series of initiatives for integrating innovative, low cost technologies for transport data collection and analysis into Bank operations. She has led the creation of the Philippines’ first transit system map using open data standards, the first open-source road crash recording and analysis system, as well as the first data collaborative with ridesharing companies for sharing traffic data. These initiatives, among others, are designed to increase the capacity of resource-constrained transport agencies to more effectively plan and manage transport systems. Prior to joining the Bank, Holly worked as an infrastructure economics and finance specialist with Parsons Brinckerhoff, an international civil and environmental engineering firm, where she was task lead and project manager for transport infrastructure projects in the US, East and Southeast Asia, and in Central America. Holly holds master’s degrees in transportation and in urban planning from the Massachusetts Institute of Technology. Jacqueline M. Klopp is currently an Associate Research Scholar at the Center for Sustainable Urban Development at Columbia University. She teaches in the Sustainable Development program at Columbia University. Her research focuses at the intersection of sustainable transport, land use, accountability, data and technology. Klopp is the author of numerous academic and popular articles on land and the politics of infrastructure with a focus on Africa and is increasingly exploring the potential of new technologies to impact transportation for the 21st Century. She is also a founder of Digital Matatus, a consortium that mapped out and created open data for bus routes in Nairobi Kenya, a project which is part of a global movement to create open data for improved public transportation. She is also part of the Digital Cairo project which aims to map public transport in Cairo and manages the NairobiPlanningInnovations Blog. Dr Herrie Schalekamp is both a research-led practitioner and a member of the academic staff at the Centre for Transport Studies at the University of Cape Town. His research and teaching focus on public transport reform in Sub-Saharan African cities, and particularly on how the minibus operations that provide mass transport in these cities might be supported and restructured to better respond to urban mobility needs. His pursuits include explorations of the business aspirations of minibus operators, alternative mechanisms through which public agencies can build positive relationships with minibus service providers, and the potential of new technologies to improve the reach and quality of public transport networks. Noémie Lehuby is co-founder of Jungle Bus, a non-profit organization that develops collaborative tools to create transport data using OpenStreetMap. Her main focus is data quality : she has worked for over five years as a Data Analyst on public transport topics and she is now building tools to check and improve quality in OpenStreetMap and to make it easier for beginners to contribute their first bus data. She is also an open source and open data enthusiast and she is involved in OSM-France, the OpenStreetMap French local chapter. Florian Lainez is co-founder of Jungle Bus, a non-profit organization that develops collaborative tools to create transport data using OpenStreetMap. Florian worked many years in the transport field as an independent consultant and a digital marketing officer for the french railway company SNCF. Passionate about Open Data and Open Source, he is dedicated to build simpler tools needed by the OpenStreetMap community to map transport networks all over the globe. 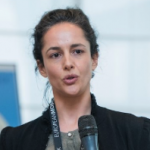 Dr Clemence Cavoli is a political scientist and historian by background, expert in multi-level governance linked to sustainable development and innovative policy-making and planning. She specializes in environmental and transport policies, in particular linked with urban mobility. Her current research projects investigate the extent to which growing cities can accelerate their urban transport development processes to support sustainable mobility, with a particular focus on Sub-Saharan African cities. She is a founder of Mapas Dos Chapas, a collaborative mapping project focused on minibuses and sustainable urban mobility in Maputo, Mozambique. Clemence advises supranational, national and local policy-makers. She regularly works as an independent expert and consultant for the European Commission and was seconded to the Science and Research Unit at the UK Department for Transport and to the EU Commission, DG MOVE. Mohamed Hegazy co-founded Transport for Cairo (TfC), an organization devoted to developing localized data collection tools to map all of Egypt’s, and Africa’s formal and informal transportation networks. This would enhance the quality of research and level of understanding of transit service provision in urban environments, and mark a concrete step in improving mobility and accessibility on the African continent. As a researcher, M. Hegazy is interested in widespread access to information and its potential to contribute directly to sustainable development. He specializes in combining the collection, integration, and analysis of data with public policy design and implementation to improve urban systems and quality of life. He was born in Cairo, Egypt and graduated with a degree in Economics from the American University in Cairo in 2012. In addition to leading TfC, he is a graduate of the ‘Governing the large Metropolis’ Masters Degree at Sciences Po in Paris, France. On his spare time, he enjoys cycling and reading up on personal biographies. Abdelrahman Melegy leads the GIS team at Transport for Cairo (TfC). He is responsible for all the data-related requirements, as well as the development of TfC’s software tools. With a computer science background and years in working in the GIS field, Abdelrahman is passionate about all things related to maps, in particular the connection between programming and Geography. 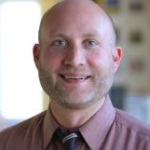 Benjamin Welle is a Senior Associate at the World Resources Institute and its WRI Ross Center for Sustainable Cities. Ben leads and supports a set of global research and projects on urban mobility and public space. He is global manager for Health and Road Safety, global lead on Walking & Bicycling and project manager for key urban mobility initiatives in Africa, in addition to coordination and support of global solutions on public transport, transport demand management, new mobility innovations and technologies, urban mobility planning, and public space in cities. Ben has a Master’s degree in urban and regional planning from the University of Minnesota and a bachelor’s degree from Hamline University, St. Paul, USA. Link with the community: involved in the creation of the website DigitalTransport4Africa with la Fabrique des Mobilités. 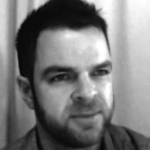 Julien de Labaca is a consultant, digital mobility specialist. Prior to create is own company, he worked for 4 years as transport director in a european cross-border public office. Before, he has worked as a mobility planner for 5 years in a urban authority in France, and for 1 year for the french public transport operator Keolis. In May 2018th, he has won the first price of the “Smart Cities” contest, organized by “Le Monde”. This price rewarded an open innovation project which it piloted for 4 years : Transfermuga. 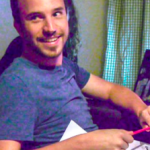 Julien holds a master degree in urban planning and transport from ENPC Paris Tech (Ecole Nationale des Ponts et Chaussées) and IUP (Institut d’Urbanisme de Paris) in 2008 and a master degree in GIS (Université de Rennes 2, Haute Bretagne) in 2007. Link with the community: involved in Digital Matatus Project. Stephine Osoro is the Technical Lead/Project Manager at Digital Matatus (DM). 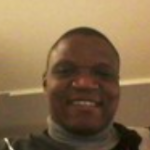 He is responsible for the development of Digital Matatus software tools and also overseeing various DM projects. Stephine is a Computer Scientist with a rich background in android mobile development, computer vision algorithms and has passion for developing open source mapping tools. Johan Richer is co-founder of jailbreak.paris, a taskforce specialized in opening software, data, APIs, applied in all fields: government, academic, non-profit or private sector. He’s passionate about helping public and civil society actors use technology for the common good and he’s part of several collaborative mapping volunteer initiatives. In France he previously worked at Etalab, the open data and open gov government agency, and at the Ministry of Foreign Affairs. He’s also a board member of f0rk, OGP Toolbox, CartONG and DemocracyOS France. Daniel Orwa Ochieng is a founding member of the Digital Matatus and the C4DLab at the University of Nairobi and currently a senior Lecturer at the School of Computing and Informatics, University of Nairobi. He has passion for developing technology systems for underserved and marginalized populations in various African contexts through Human Centered Design. Daniel holds a PhD from the University of Nairobi and a postdoc from KTH Royal Technical Institute, Sweden.